I'm a big fan of those down home productions from Greenville, MS as the pages on Vicki Williams, Vikki Styles and Frank Tenella demonstrate. 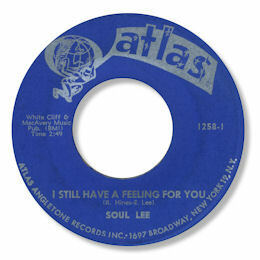 The Soul Lee sides are amongst the most intense of them all, and while the Reginald Hines produced 45 I Need You is a good - if primitive - soul ballad with Lee's vocal confident and throatily effective over a small band backing with a quite unusal organ prominent, the single that found it's way onto New York's Atlas label is the best of his sides by far. 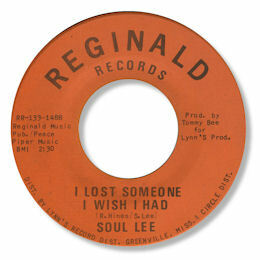 Judging by the sound of I Still Have A Feeling For You, epsecially the organ, this was cut at the same session as the Reginald single but the song and the arrangement are far superior. 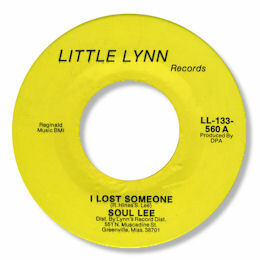 This is a fine blues ballad with a fuller backing - you can just about make out the subdued horn section - but best of all is Lee's impassioned wailing, a considerable notch or two higher up the scale than his previous release. Just love those hoarse screams towards the end! Note ~ VIC LEE on the related label Big Beat is a different artist.